Canada’s most famous track relay team of the latter half of the 20th century was composed of members of different cultural backgrounds that came together to win gold. The team included Robert Esmie (born 1972), Donovan Bailey (born 1967), Glenroy Gilbert (born 1968) and Bruny Surin (born 1967). All four members were born in another nation, but moved to Canada at a young age. Esmie grew up in Sudbury, Bailey in Oakville, Gilbert in Ottawa and Surin in Montreal. 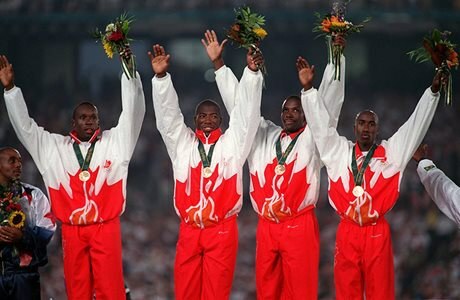 As a team, they excelled at the 1996 Olympics in Atlanta, winning the gold medal for the 4 x 100-metre relay in a time of 37.69 seconds – 0.29 seconds off the world record. The team was inducted into Canada’s Sports Hall of Fame in 2008. See an interview with Brian Williams from CBC Sports on August 3, 1996 (part of the CBC Digital Archives). Read more about these Canada’s Sports Hall of Fame inductees.